BZ A has associated with several architects over the years, in this case we joined ranks with Vic Shnider, formerly of Richard Mier and Associates, Los Angeles. Vic came to us because of our association with Legorreta Arquitectos in order to form a well balanced team of architects to facilitate the many components of this house. 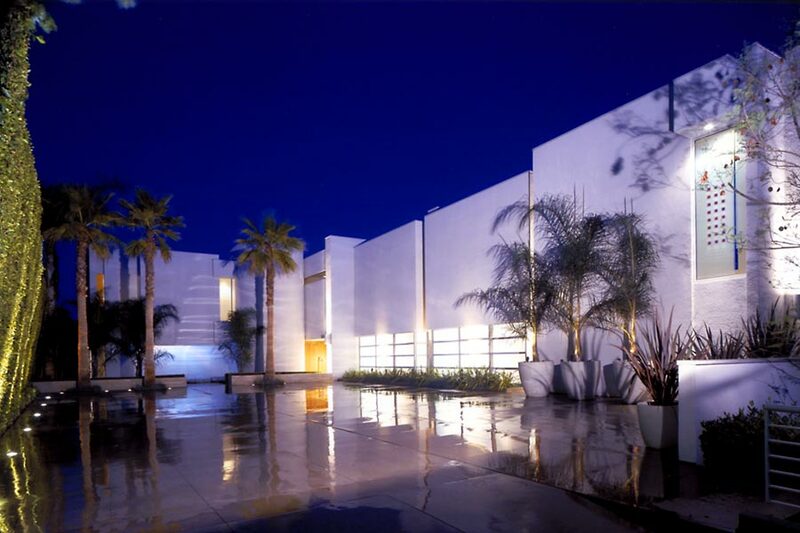 The original house was designed by renowned Los Angeles Architects Buff and Hensman in the nineteen seventies. When the adjoining property became available, the Owners hired Vic as the architect for the new project. The addition, which is almost as large as the original house, required exact detailing and replication of materials in order to blend the two buildings together. The detached tennis pavilion and family room offered an opportunity to create an architectural annex of a slightly more contemporary style. The influence of Vic’s tenure with Mier and Associates is clearly visible in the design. In order to maintain the integrity of the house, we used existing drawings the Owner gave us to study the detailing as well as photographing and documenting the various components of the house. We worked together with Vic to insure that the joined buildings were harmoniously married together. Plaster texture, window systems and interior materials needed to match and blend together. We connected the outdoor spaces by using the same concrete colors and textures as well as limestone pavers used in the original building. Landscaping was redone around the entire property to enhance the unified appearance. The new property also afforded room for a new tennis court and adjoining pavilion, which is often used by the teenage children for parties and family gatherings. The ceiling height doors open and lock to create an indoor / outdoor environment, connecting directly to the tennis court on the west and the long grass yard to the north. The hillside setting overlooking the Rose Bowl creates spectacular views to the east and the San Gabriel Mountains to the north. The finished project is a compilation of contemporary architectural styles of the last thirty years, melded into one, very majestic setting.